Focaccia and pepperoni pizza prototypes for soldiers’ meals at the Natick Laboratory Army Research, Development, And Engineering Center. Until now, deployed soldiers haven’t had pizza MREs as a meal option. Presumably, when in combat and far from home, troops want a slice of American comfort food. But engineering shelf-stable, Meal Ready-To-Eat pizzas was a tough task—and scientists have just now broken the barrier. 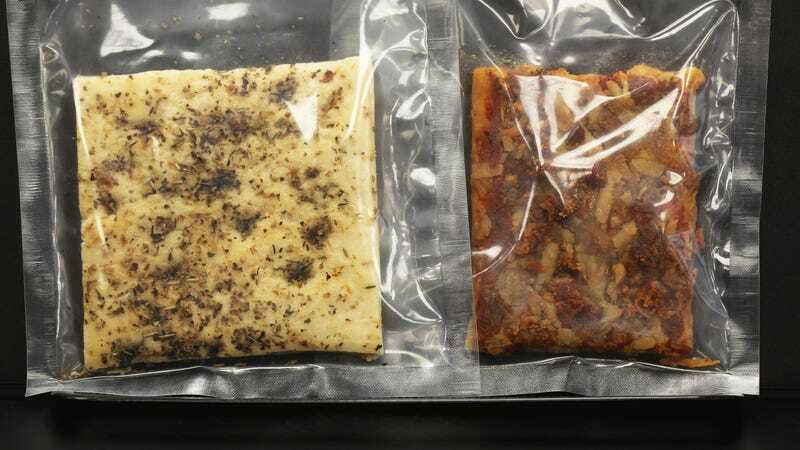 The U.S. Army Natick Soldier Research, Development, And Engineering Center announced its scientists have finally “overcome the obstacles” and developed a successful pizza MRE. MREs must be shelf-stable for up to three years at 80-degree temperatures—not exactly pizza’s ideal storage conditions. But experiments in pH, water activity, and packaging innovation finally allowed scientists in the Combat Feeding Directorate to whip up a pizza that meets MRE requirements. The Army reports two private food manufacturing plants were able to follow the specifications and produce the pizza for the military. “This product is a great example of using food science to meet the challenging and unique requirements for military rations,” Stephen Moody, director of NSRDEC’s Combat Feeding Directorate, said in the statement. While the slices probably don’t replicate the tangy tomato sauce of troops’ favorite pizza chains, they were met with positive feedback in initial taste tests. We feel unqualified to say whether military spending on billion-dollar fighter jets or tactical gear is the best use of taxpayer dollars, but we unequivocally stand behind our troops’ right to eat pizza while deployed. Pizza’s gotten us through tough times; why would our troops not be afforded the same? According to the Army, the military first packaged up the pepperoni pizza MREs last month.